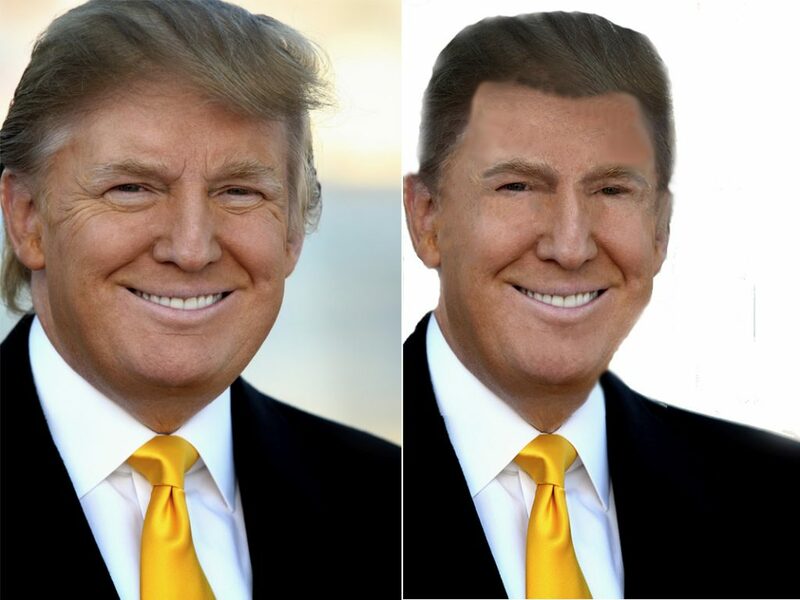 In this example, i will be making Donald Trump younger in photoshop. I am by no means a Photoshop expert and everything is self thought. Also, I did not want to spend too much time on this, so this is not perfect. For example, it needs a little more cleaning up and cropping along the edges. This tutorial will assume you have some basic knowledge of photoshop. 4- Do the same thing for eye brows. 5- Merge the layer for the hair and eye brows. 6- Using Brightness and contrast tool, make the hair darker. 7- You will notice some edges do not bland well. Using the eraser pick a brush that is not solid and smooth out the edges. 10- Using the smudge tool reduce the hair line on the forehead and also the hair around the outside. You may also want to use the Clone Stamp Tool for certain areas, too copy skin or hair texture. which is what I did. 12- With the box select tool highlight a portion of the jacket on the right, the hit CONTROL T to select that area for resizing. Make it bigger to look like the original size of the picture. You may need to smooth it out with the smudge tool. Now would you vote for him?? ?